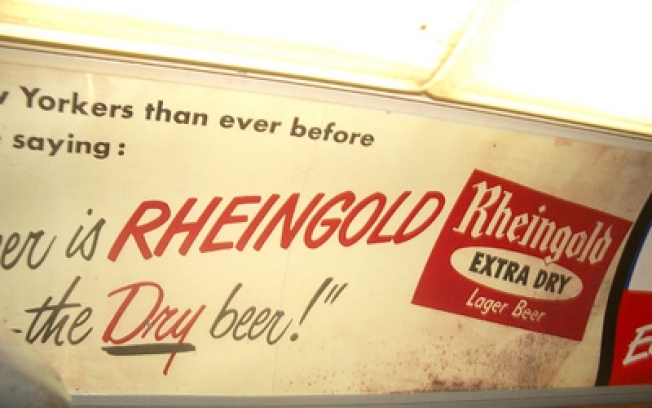 The MTA's nostalgia train is a fun, quaint trip into New York's past. It's almost sweet how the bumbling MTA keeps trying to distract us from its budgetary woes and naked ploys to jack up the subway fare to double digits with quaint throwbacky experiences this December. First they hauled out a fleet of 19 buses from the late '50s and early '60s (which caused something of a stir for not being wheelchair accessible) and now there's the "nostalgia train": They've gone and pulled a subway train from 50-odd years ago out of mothballs and put it back in circulation along the V line for the holiday season. The best part is the ads, which are authentically from the era -- blogger East Village Idiot has an excellent run-down of some of the ones he saw in his car of the nostalgia train, including one pre-transfat-ban banner for Crisco about how children need to eat fats, and Crisco is the only "vegetable shortening of SURE digestibility." Ah, those were the days. The Nostalgia Train runs on the V line from 2nd Avenue to Queens Plaza every Sunday in December -- more info (including approximate scheduling times) at the MTA website.